KCRW Good Food Producer Gillian Ferguson shares highlights from farmers’ markets around Los Angeles, along with tips from chefs and growers on how to best use what’s in your basket. This was the message from Fred Armisen and Carrie Bradshaw in a recent Portlandia sketch they co-produced with the Cooking Channel. In it they detail how to order coffee with seriousness and composure. (Hint: tip quietly and don’t ask too many questions). We’re all in on the joke by now, but in a shocking twist of fate, Southern California is actually out-Portlanding PDX on the coffee game with one word: local. Los Angeles obviously has it’s own coffee culture to be proud of, but a new crop of locally-grown coffee beans could literally put Southern California on the coffee map in a big way. It sounds downright twee in an age where everything from honey to kombucha is being touted as local, but this is not a joke. Jay Ruskey of Goleta, California and Jim Shanley of Morro Bay are hedging their bets that you will want local coffee to cure that hangover caused by the local whiskey you drank last night. “I am the world’s northernmost coffee grower as far as we can tell,” says Shanley, talking about the 550 coffee plants he’s growing on a south facing hillside just outside Morro Bay. Yesterday morning at the Santa Monica Farmers’ Market, eight starter plants, each roughly a foot tall, sat on the Shanley Farms’ table. The price tag for each heirloom Caturra or Gesha plant was $25. Shanley, who was an early adopter of finger limes and fresh goji berries, seems to know a good marketing opportunity when he sees it. He started his finger lime business with six hundred trees on three acres. Today he is up to four thousand trees on two farms. “I had many offers my first year to buy my entire crop,” he tells me; and today he sells his finger limes on three continents and has imported two new varieties (one with blood red flesh) to keep up with demand. Like finger limes, coffee is a crop that was simply not grown in California. “People said it wasn’t possible,” he explains. And almost immediately he gives credit for the idea to Mark Gaskell, a University of California advisor and “coffee nut,” according to Shanley. During a visit to Panama, Gaskell discovered that regional growers were having to move to higher and higher altitudes in the tropics to grow their premium coffee. What he realized, was that the microclimates where premium coffee was thriving were very similar to Southern California. It was roughly ten years ago when he shared the news with Shanley’s growing partner Jay Ruskey, who began growing test plants in Goleta. So far, the Asian market has proved that consumers do want to drink elite coffees. Shanley and Ruskey are currently selling their beans at $60/pound to buyers in Japan, China, and South Korea where high end coffee culture has exploded in recent years. Whether or not California coffee becomes a foodie badge of honor here in the U.S. remains to be scene, but if you’ve eaten a finger lime in the last year, you can bet you’ll be drinking California coffee soon enough. Where to find Shanley Farms: Shanley Farms sells finger limes, Morro Bay avocados and coffee plants at the Wednesday Santa Monica Farmers’ Market. 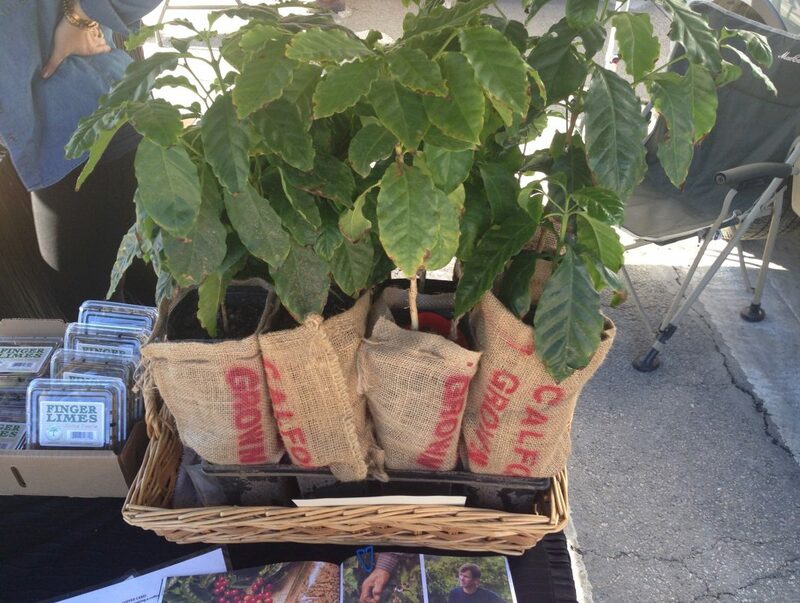 You can also visit Jay Ruskey’s coffee planting at Good Land Organics in Goleta, CA.